Tier One consists of your top revenue producers. This is usually your home market plus a couple of nearby markets that have been doing business in for a long time. Companies that are new to internationalization may have only a single Tier One market. — any business from outside the home market is purely accidental. 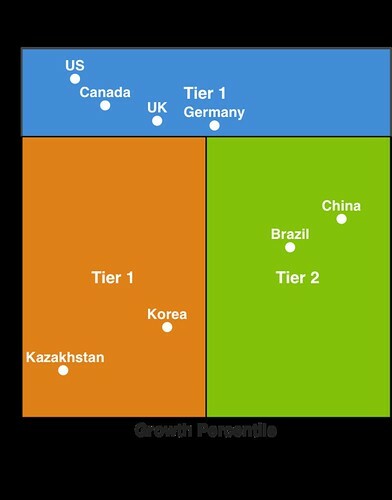 Mature global businesses might have 3 or 4 tier one markets. Some of the larger companies have up to 10. Tier One markets should have their own regional offices with marketing departments that are capable of generating original content that is tuned to the interests, culture, and calendar of local population. You can optimize the efficiency of these local marketing teams by translating and re-purposing content from your home market. But with that much revenue at stake, you should have a local presence keeping an eye on things from a local perspective. Tier Two is made up of your fastest growing markets. Revenue may be small today and growth might be a short term anomaly, but you want to nurture these markets because some of them might have potential to be new Tier One markets for you. Collectively, Tier Two might be responsible for a considerable portion of your overall revenue grotj. You want to treat these markets with a first-class experience but you need to do it efficiently. Balance cost reduction with experimentation and responsiveness to opportunity in Tier Two. You want to tune and experiment to see what response you can get from these markets. But you don't want to over-invest because the long term potential may not be that great. Most of the content that you serve Tier Two markets is going to directly localized (translated and adapted for cultural compatibility) from the home market. Of course, you want to be able to filter out what you know will not be relevant. You should invest in things like local search engine optimization and social media and be paying very close attention to web analytics and sales data. You may need a local marketing team to do this, or you may not. Perhaps you land the local marketing team when the market shows movement toward your Tier One zone. Tier Three is the long tail — all the markets that don't fall into tiers 1 and 2. You want to maintain a quality digital presence in these markets but you want to do it cost effectively. If you are successful, cumulatively Tier Three could be a decent profit source and can be the farm system to recruit your next Tier Two markets. Otherwise you will either over-spend or one of your competitors will beat you into a market with great potential because you didn't invest enough. Market tiers should also drive your content technology architecture. If you have multiple, distinct Tier One markets, you will need a CMS that supports multiple semi or fully autonomous sites. Depending on your governance model, you might need to be able to "lock-down" certain site sections to give centralized corporate marketing direct control. Some companies are totally decentralized and allow Tier One markets to operate their own instance of the CMS. I wouldn't advise different markets going with a totally different CMS platform. Doing is more expensive because you need to maintain more expertise and you might need to do integration in order to share content. Tier Two might start out with a translation proxy as long as the proxy technology allows you to easily filter and/or replace content. As it inches toward Tier One, you might want to give a Tier Two market a sub-site as long as your platform allows you to efficiently replicate and localize home market content. Otherwise, supporting the sub site will be more work than it is worth. Whatever you do, try to discourage Tier Two markets from building out their own infrastructure. It is costly and will be difficult for them to maintain to the level that your brand deserves. Tier Three markets should never run their own websites. This is where embarrassing happen like butchered logos and layouts that look like they were stolen from GeoCities or MySpace. In my opinion, translation proxy is 100% the right choice for Tier Three. A useful technique here is to build smaller "International Site" on your home infrastructure. This site is style-guide compliant and brand-worthy but has pared down content and functionality. You don't update it as often and you avoid time sensitive content like an "upcoming events" section. Then you use a translation proxy to efficiently localize this site for all your Tier Three markets. Most companies stumble into internationalization after years of vague expectation. They know there is opportunity outside of their home market and plan to get there one day. Then they find some compelling event that initiates a poorly executed project. This could be rogue site implemented by a team without time or budget. Or it could be a monster project that gets scuttled when people start to realize how hard it is to retrofit a WCMS for internationalization. If this sounds like your company, don't feel bad. You would be surprised how big and well known companies struggle with this. The good news is that by strategically targeting markets and making the right investments to get there, you can easily outperform most of your competition.